26.2 Training Tips for Your First Marathon! NOW is the time to start training for a fall or spring marathon! There are hundreds to choose from at MarathonGuide.com. 1. Don't Procrastinate! The first thing you need to do is get out there and start running. Talking about it is fine, but start making it happen! Today! 2. Start Slow and Go Steady: Don't try to prove something by running 10 miles your first time out. You'll injure yourself! Unless you're already a runner with solid base mileage, start out easy, maybe 10 to 15 miles in 3 to 4 runs per week. Increase weekly mileage no more than 10%. 4. Buy Decent Shoes and Change Them Often: Running is a very inexpensive in terms of equipment. So don't go cheap on the shoes. Change them often...the lesser of every 300 miles or 3 months. Your limbs and tendons will thank you for that. 5. Ramp up the Mileage: To run your first full marathon, plan to peak your weekly mileage at 30 to 35 miles per week. But once again, get there gradually, not all at once. 6. Rest as Needed: For those of us past the motivation hurdle to train, the next biggest marathon training issue is fending off injuries. Don't be fearful of taking days off when needed. Rest benefits you as much as training. 7. Train With Others: The best thing to motivate one to wake up at 5 a.m. on a Sunday morning for a 20 miler is knowing you'll be letting someone else down. Click here for some local Ventura County running groups. 8. Share Your Goals: Tell your friends and family about your marathon commitment and your training. You'll need the support system and they'll keep you motivated. 9. Try Shorter Races: There are nearly 100 local Ventura County and surrounding area 5K, 10K, 1 Mile, Half Marathon and other races each year. Try them for practice! Lots of fun! 10. Cross Training is OK: The key elements to running a marathon are building aerobic endurance (heart/lungs) and muscle endurance specific to long distance running. Cross training is fine and good but keep those 2 things in mind. Aqua jogging is an example of an effective cross training exercise for marathoners. 11. Buy the Right Clothes: Visit a local store for running shorts, socks and "breathable" (i.e. non-cotton) shirts for your longer runs. You'll get plenty of use out of them. 12. Eat Right: Everyone says you have to "carbo load" for running a marathon but my feeling is you just need to eat a reasonable, well-balanced diet. Yes, it can't hurt to eat extra pasta, but the main thing is eating healthful food that agrees with you! Even 100-meter world record holder Usain Bolt can get away with eating chicken nuggets. Love it. 13. Gradually Increase Your Long Runs: Pick a day during the week that you can "run long" and try to increase the duration of that long run by 1 to 2 miles each week, or every other week. If you can run 20 miles in training, you'll be able to run 26.2 on marathon day. 14. Run Early or Late in the Summer: Training for a marathon through the summer months can be a challenge due to the heat. Running in 90 degree heat isn't exactly good for you. Wake up early for your runs or perhaps enjoy running at night after it cools down a bit. Your options expand in the Winter months in our nice Southern California climate! 15. Don't Worry About Speed: For most running their first marathon, the primary goal is to finish the full 26.2. Since you'll be doing more mileage than ever before, don't beat yourself up and worry about your speed. Just get out there and enjoy yourself while ramping up the mileage. Worry about speed your 2nd marathon! 16. Running in Sickness and in Health: Use your best judgment when sick. I run through most colds without a problem. Makes me feel better. But when you do have to take time off, don't feel guilty about it! 17. Injury Pains vs Aches: As with illnesses, there are some injuries that literally force me to stop training, like lower back problems. Training through general aches and pains is fine. But if the pain is so sharp that you grimace with each step, you best stop running and start resting, icing, compressing and elevating. 18. Hydrate Early & Often: Carry fluids for runs over an hour or so if you can. Don't want to chance dehydration during a long run. That said, I generally can hold out for 1 1/2 hours, depending on the temperature. In any case, drink more all the time and you'll be fine. 19. Run by Time, Not Mileage: Precision is not required when training for a marathon. You can measure your mileage if you'd like, but you can also measure your runs by time/duration. Your biggest concern should be getting out there and running. Don't burden yourself with precision if you don't have the time. 20. Don't Feel Guilty About Breaks: Summer means vacation. Some you can run on, others you can't. Bottom line is to enjoy your vacation and not sweat taking a break. Perhaps run extra mileage the week before if it makes ya feel better! You'll come back stronger. 21. Tricks of the Trade: Learn the "little" things that make a big difference in distance running...double knotting your shoes, lubricating your feet and other areas to prevent chafing, sunscreen, timing, etc. The little things make a BIG difference running a marathon. 22. Tried and Tested Race Day: Don't make the big time beginner's mistake of trying something new on race day...new shoes, new breakfast food, new clothes, etc. Everything you do on marathon day you should have done already in practice. 23. It's All About the Mileage: You can't fool your body into running a marathon. It takes courage, persistence and determination. Don't mess around. Motivate yourself. Read a good book about marathoning. Most importantly, just GET OUT THERE and RUN! 24. The Taper: After months and months of hard training, give your body a break and taper down the mileage the final 2 to 4 weeks pre-marathon. You've done the homework. Now let your body replenish itself for the real deal! 25. Sleep is Your Savior: So you started out as a 1 day a week jogger and 4 months later you're doing 30 miles, 4 to 5 hours of weekly training. Don't even think about cutting back your sleep hours. You may even need more! Ah yes, no one said this would be easy! 26. Mix Up the Surface: No doubt about it. If you're running a "road" marathon, you'll need to do a lot of training on the streets. But ain't nothing wrong about running on trails to add variety to your training. Added bonus is that trails are more forgiving on the body. 26.2. HAVE FUN! Last but not least...ENJOY YOURSELF! Running a full marathon is a major accomplishment, so don't stress out over it! 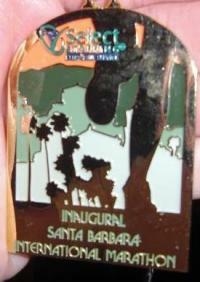 Go out there, do your best and reap the rewards of earning your first marathon finisher's medal!! Click here for more Conejo Joe training advice. Click here for upcoming local Ventura County area races. Click here to scream at him, compliment him or ask him questions.